Glasgow born painter of portraits and figure studies. Daughter of Alexander Davidson Deans, an Aberdeen based etcher and engraver. In 1883 she attended Glasgow School of Art where fellow pupils included Margaret Rowat, Charles Rennie Macintosh, Bessie Mac Nicol and David Gauld. In 1890 she was the first woman to be awarded the Haldine Scolarship and went to Paris to study at the Academie Colarossi. 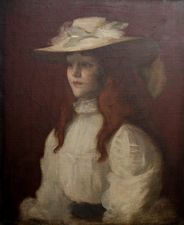 She exhibited at the Royal Glasgow Institute, Royal Scottish Academy and the International Society in London. She married the artist Robert Macauley Stevenson. She was a member of the prestigious Glasgow Society of Lady Artists Club. She died in 1944.